From Wikipedia: Vessel (TKA) is a public structure and landmark that was built as part of the Hudson Yards Redevelopment Project in Manhattan, New York City, New York. Construction began in April 2017; it opened on March 15, 2019. Designed by the British designer Thomas Heatherwick, the elaborate honeycomb-like structure rises 16 stories and consists of 154 flights of stairs, 2,500 steps, and 80 landings for visitors to climb. 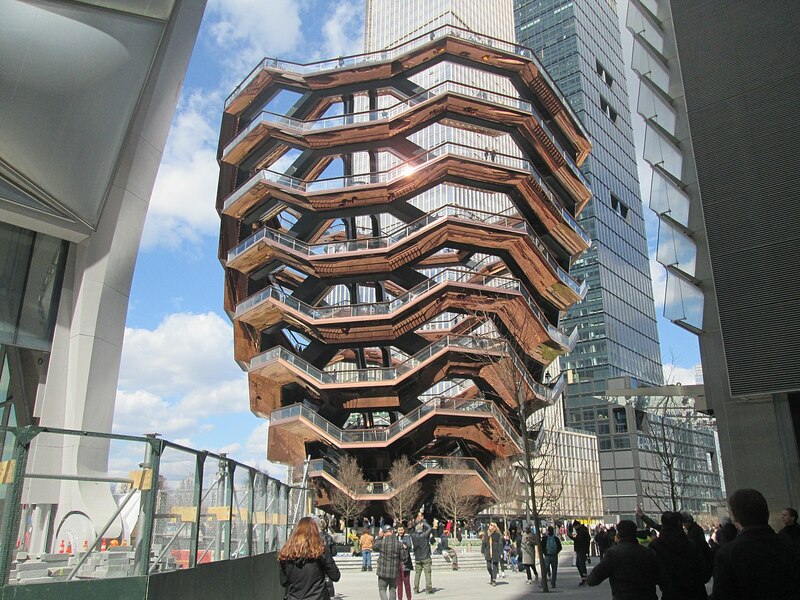 Vessel is the main feature of the 5-acre (2.0 ha) Hudson Yards Public Square. Its final cost is expected to be $200 million. The structure’s name is a working title, noted in the TKA abbreviation, which means “Temporarily Known As”. The structure owners have asked the public to give it a formal name and have a website devoted to naming it. One of the most discussed names on social media was “The Shawarma“, after the cone-shaped meat popular on street carts. Advance Tickets: Free tickets are made available for two week time periods. Each day at 8:00am EST, a new future day of on-line booking is made available. Same-Day Tickets: Every morning beginning at 9:30am EST, same-day tickets are made available on-site at Hudson Yards. Upon arrival, speak with a Vessel Ambassador in the Public Square and Gardens. Tickets are available for time slots throughout the day.